The Levant News — The Israel Air Force will continue to execute missions in Syria to contain threats against the country, Israeli Prime Minister Benjamin Netanyahu told reporters in China on Tuesday, dismissing reports that Russia had asked for an end to such defensive actions. Netanyahu said he made this clear to Russian President Vladimir Putin when the two leaders met in Moscow earlier this month. He explained that Israel would continue to act against arms shipments to Hezbollah as it did on Friday, when the IAF struck an arms convoy near the city of Palmyra. “In those situations we do not have any other choice but to act,” he added. MK Tzipi Livni (Zionist Union) said on Tuesday that such arms shipments are in violation of an existing UN resolution and that Israel’s actions could be seen as supporting the rules of engagement in that area. On Monday, Syrian President Bashar Assad said his country would continue to defend its borders against such strikes. Friday’s attack was unusual in that Syria shot anti-aircraft missiles at Israeli jets. Russia also summoned Israeli Ambassador Gary Koren to defend the strike, which took place close to its troops. On the issue of the Israeli- Palestinian conflict, Netanyahu said that Israel and the Trump administration are working to come to an understanding with regard to building in the West Bank. These talks do not include building in areas of Jerusalem over the pre-1967 lines, he said. Netanyahu had similarly clarified that Israel would continue to build in east Jerusalem when he spoke with reporters in Washington last month. Chinese President Xi Jinping told Netanyahu on Tuesday that peaceful coexistence with the Palestinians would be good for both sides. Xi, whose country has traditionally played only a small role in Middle East conflicts and diplomacy despite its reliance on the region for oil, said a peaceful and stable Middle East is in everyone’s best interests. He added that China has cultivated increasingly close relations with countries in the region, according to a statement from China’s Foreign Ministry. It has, for example, tried to help in efforts to end Syria’s civil war. Beijing-based diplomats said China considers itself an honest broker without the historical baggage the Americans and Europeans have in the region. Peaceful coexistence between Israel and Palestine would be good for both parties and the region, and is what the whole of the international community favors, Xi said. Chinese envoys occasionally visit Israel and the Palestinian territories, but Chinese efforts to mediate or play a role in the long-standing dispute have never amounted to much, although China has traditionally had a good relationship with the Palestinians. Netanyahu told Xi that Israel admires China’s capabilities, its position on the world stage and in history. “We have always believed, as we discussed on my previous visit, that Israel can be a partner, a junior partner, but a perfect partner for China in the development of a variety of technologies that change the way we live, how long we live, how healthy we live, the water we drink, the food we eat, the milk that we drink – in every area,” he said. Netanyahu is in China to mark 25 years of diplomatic ties between the two countries. On Tuesday, the two leaders announced the establishment of a comprehensive partnership of innovation between the two countries. Xi said that since China and Israel established diplomatic relations 25 years ago, they have maintained a stable and healthy development in their bilateral ties. The two countries have seen frequent exchanges through high-level visits while steadily pushing forward pragmatic cooperation, and their people-to-people exchanges have been getting closer, Xi added. During recent years in particular, innovation cooperation between China and Israel has promoted strong and continuous positive development of bilateral ties, Xi said. Establishment of the comprehensive partnership of innovation will further enhance this innovation cooperation, better realize complementary advantages and bring more tangible benefits to the peoples of the two countries, Xi continued. The two sides should enhance political communications, further strengthen exchanges at various levels in different fields and boost mutual understanding and trust, Xi said. He added that the two countries should boost alignment of development strategies and steadily push forward major cooperation projects within the framework of the Belt and Road Initiative, focusing on cooperation in fields including scientific and technological innovation, water resources, agriculture, healthcare and clean energy, while deepening and expanding pragmatic cooperation. Netanyahu and his wife, Sara, also laid a wreath at the Monument to the People’s Heroes in Tiananmen Square. 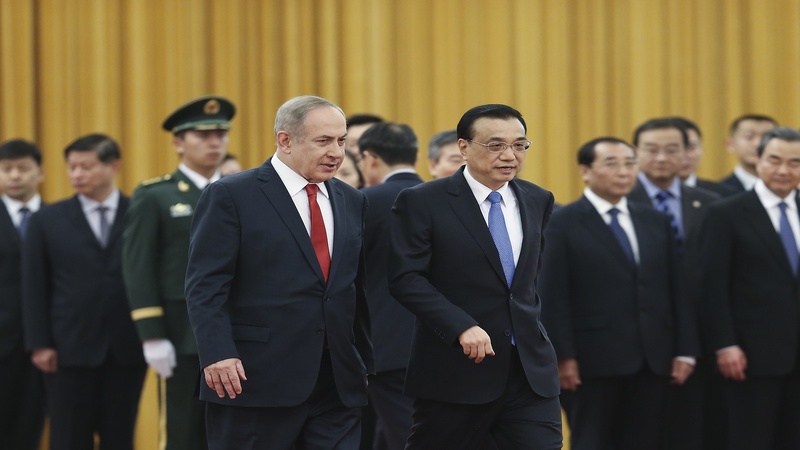 Netanyahu then proceeded to the Great Hall of the People, where he met with National People’s Congress standing committee chairman Zhang Dejiang. “We have made great strides in the 25 years that we’ve had this friendship. We have come a long way on cooperation about economic possibilities, about the betterment of life. And these are all real things that are happening, and I think it’s a great message to our people, but also to the people of the world,” Netanyahu told the chairman.